Get a more reliable solder joint for all of your tasks without the concern of using solder containing lead. Featuring a chemistry of 99.3% tin and 0.7% silver, this lead-free solder alleviates concerns about the effects of lead on the body and on the environment. Ideal for general purpose soldering tasks like PC board repair and tinning wires. Rosin in the solder core melts before the solder and chemically cleans the surfaces for a more reliable solder joint. 1mm diameter is suited for most soldering tasks. 1 pound roll is a generous amount for the avid electronics enthusiast or electronics professional. So much easier to solder or assemble tiny wires and components. Every technician will eventually need a little extra help when soldering or assembling a project. 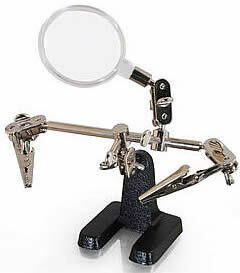 Pieces and parts get too small to handle but our Helping Hands with Magnifier can really make it easier. Two small adjustable clips hold items at almost any necessary angle. The magnifier really helps you the finest details. The sturdy cast metal base stays in place throughout the operation. 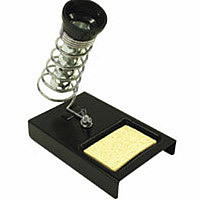 Keep your soldering iron safe and at hand with this solder station. The safety spring design keeps the hot iron away from work and lessens the chance of a dangerous burn. A sponge receptacle keeps a sponge at hand for cleaning residue from the iron’s tip.